As usual I use Cryosphere Today area in preference to extent, which I consider to be an over filtered and clumsy tool, left axis units million (M) km^2. Current Area is high for the post 2007 period. 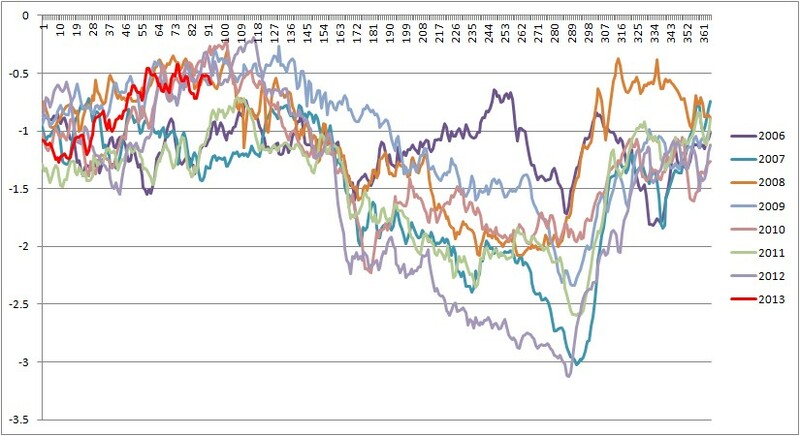 However in the context of the full series of daily maxima from 1979, 2013 is still clearly within the post 2005 group. 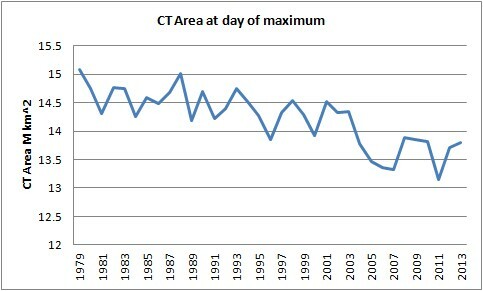 After last year's exceptionally late date of maximum, this year the CT Area maximum was on day 59, 28/2/13, and was not exceptional, unlike 2012. 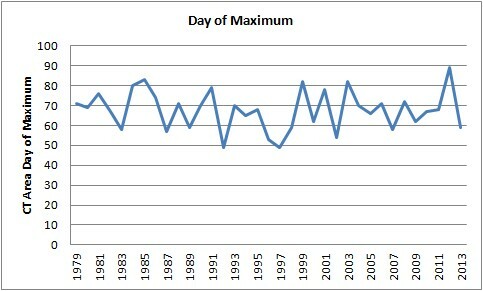 Change in the date of maximum in response to the preceding year's minimum area is not to be expected, as the above graphic shows, if there is a trend it is not strong. 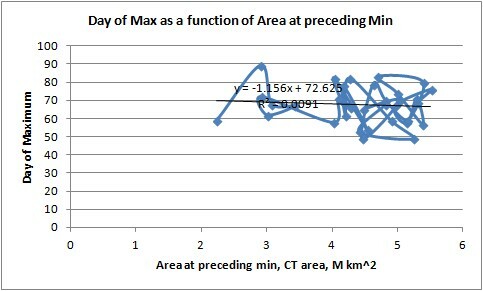 And plotting day of maximum as a function of the preceding year's minimum area confirms that there is no relationship. As area decreases nothing about the vertical variation seems to change along with the reduction in area. The trend of a linear fit has an R2 of 0.0091, i.e. the trend line explains almost nothing of changes in the day of maximum, (apologies for not shifting the plot details into the whitespace). This is because the day of max (and min) is set by insolation changes with a small random variation due to weather, the same applies to the date of minimum. PIOMAS volume anomalies show that volume has caught up with 2011 and 2012, this is due to the thickness/growth feedback and, although I got this one wrong (I had expected a drop in volume), it is not surprising. It is due to the thickness/growth feedback, which is discussed further on in this post. The anomalies (difference from long term mean, which is from 1980 to 1999), show the gain of volume over the early part of 2013. Both of these graphics are in units of thousand (k) km^3. The ice in Beaufort is still showing signs of the fragmentation event and high pressure still largely dominates, however due to sub-zero temperatures the leads have remained frozen over, indeed they froze as soon as they opened. That noted, this new ice will not have time to thicken substantially, so despite the influx of multi-year ice (MYI) into Beaufort, this MYI may not have as stabilising an impact as might otherwise be the case. NSIDC have presented a graphic (by Trudy Wohlleben at Environment Canada) showing how the MYI has been split between flux into Beaufort and flux into the Fram Strait, link. This shows that whilst the circulation in Beaufort has been substantial, the Fram outflow also seems to have been. Flux through the Fram Strait is volume lost to the ice pack as it melts on its transit southwards down the coast of Greenland, flux into Beaufort may survive, provided it is not transported out of Beaufort along the Alaskan Coast. So nothing about current conditions changes my opinion about this year. I still think we will see a new record set by a substantial margin, while I am still convinced that talk of sea ice free this year is unfounded. From the other angle; anyone who sees a recovery in the data would be best to preface what they claim with: "I really haven't got the faintest clue what I'm talking about, but...". Just so that they have a fall back position when it's shown that the current data doesn't support them. Above I mentioned that with the very large area of open water last year there has been a very vigorous response in terms of ice growth. This is because new ice grows by accretion of new ice onto its base from the ocean, this accretion is driven by the heat flux through the ice, if the ice is thinner the heat flux is greater and ice growth is more rapid, as the ice thickens heat flux through it reduces and ice growth reduces. So although the minimum volume has decreased, the growth in the autumn/winter has increased to compensate. This is a major negative feedback, and its power can be seen in the volume gain since last year's record minimum. Indeed it was this feedback that was the main reason I was still sceptical of claims of a rapid transition to a seasonally sea ice free state as late as 2011. 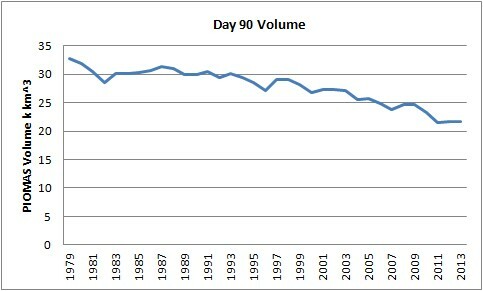 It is worth drawing attention to the volume at day 90, the latest day of volume data, specifically the observation that the last three years have had virtually the same winter volume. Note that we are now so close to the daily peak that what I discuss now will also refer to the peak in April, massive changes are highly unlikely. In comments to my previous post Kevin O'Neill pointed this out, although I had already noticed it, in the time taken to write this post amidst other commitments it has been commented on elsewhere. We both seem to attach importance to the same details, and we're both working in engineering, I don't think this is coincidental. In terms of the sea ice thickness/growth feedback the crucial thing is the area at minimum as this sets the amount of open water over which new ice will grow. So in the following scatter plot I've presented volume gain from the September of the previous year to March of the current year (both monthly averages), as a function of the (daily) area at minimum preceding that volume gain. There is a clear non linear relationship, as sea ice area goes down, volume of ice produced in the following autumn goes up. Although I'm not convinced that the zero area volume gain being about 21k km^3 is anything but a coincidence (current volume is just over 21k km^3). What this relationship does show is that as the area goes down, volume increases during autumn and winter to an increasing degree. Will this slow down the rate of volume loss? Without substantial continuing volume loss in the winter it will not be possible to rapidly attain a seasonally sea ice free state. This is seen in PIOMAS where the convergence of average thickness in April and average seasonal melt is mainly due to loss of thickness in April, with April to September thickness loss increasing at a substantially lower rate. The following graphic is calculated for the Arctic north of 65degN from gridded PIOMAS data, units are in metres of thickness. One factor that is increasing the volume loss during the melt season in PIOMAS is thinner ice, which is creating an aggressive spring melt. However, from my reading, PIOMAS does not seem to factor in albedo change due to the loss of MYI and transition to a predominantly first year ice (FYI) pack. This may account for the spring volume loss changing to a less aggressive late summer melt, see volume anomalies above after day 170 for the three recent years; with ice albedo changes the late summer loss may be higher than the average, not lower as at present. If the fact that the most recent three years have near equal volume during the winter is not merely random chance, it could be that we are beginning to see the start of an inflection in volume loss. In this scenario the increased volume losses in spring, and possibly summer, would be countered to an increasing degree by volume gains in the autumn/winter, which would act to stem the loss of volume. However losses in the melt season could not be able to keep up, meaning that the thickness/growth feedback in autumn would be the negative feedback that brings about an inflection in the seemingly remorseless volume loss. This is what I had been expecting, but had given up hope of seeing due to the behaviour of the ice in the last few years. Perhaps I called it too early. 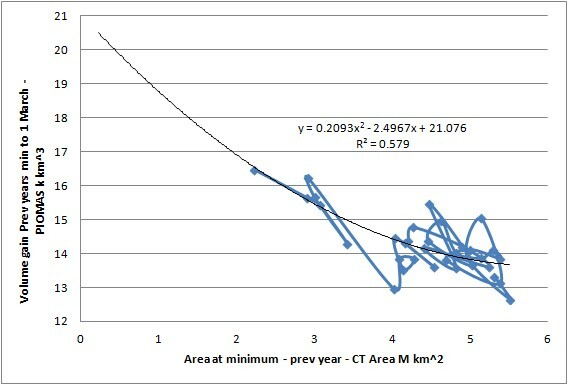 My opinion that we're in a Rapid Ice Loss Event (RILE) is formed largely from modelling studies, together with reasoning around loss of MYI volume and its implications. One factor that occurs during the RILEs is thickness (hence volume) losses from successive winters, this volume loss then drives the summer crashes in area by Open Water Formation Efficiency (OWFE). OWFE from PIOMAS is showing similar behaviour to that seen in modelling study RILEs, as I blogged here. In the last three years, are we seeing behaviour that is indicative of an inflection in the winter volume losses? Much of the pack is currently FYI, so these regions are similar to what we will have after a seasonally sea ice free summer, all FYI. 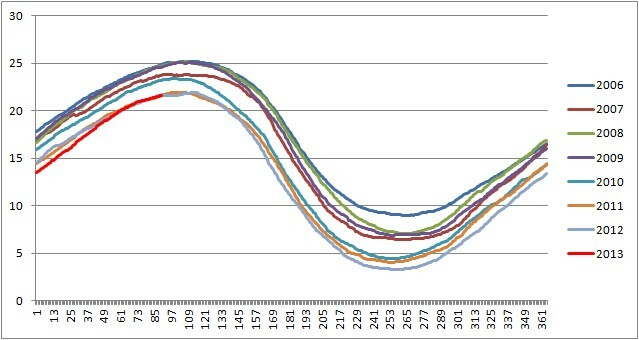 The coloured region is different ages of ice, the darker blue is all FYI (first year ice). How much positive feedback can we get from the further elimination of the MYI? Will this be enough to counter the thickness/growth negative feedback in the autumn/winter? So as we enter the melt season I await a test of how important MYI/FYI is to the pack, if FYI is much more prone to melt we should see a new record by a significant margin. But we won't see the impact of conditions within the Arctic Ocean until June when the melt there really gets going. And for the future, what of the implications of a possible stall to winter volume decline and its possible implications for overall volume decline? Too little hysteresis in opinion makes such opinions worse than useless, as they change so frequently nobody can be bothered paying attention, and rightly so. I'm not going to change my opinion on whether we face a rapid transition to a seasonally sea ice free state. My opinion remains that we are in a RILE, and that by 2020 we'll see so little ice at the end of summer only a pedant would claim no such transition has happened, pedants are to be ignored as much as those who change their opinions when the wind changes direction. But I will be watching winter volume and autumn winter volume gains with interest. It is possible I'll conclude in the coming years that I changed my mind too soon, but I'll need more evidence before I change my mind back. As I think back to our initial surprise at the results of Tietsche et al, "Recovery mechanisms of Arctic summer sea ice", it wasn't that there was a large negative feedback - but that it was large enough to drive an ice-free arctic back to initial conditions in such a short time period - within 3 years for most model runs. We never questioned that there would be winter ice-formed; neither you nor I believed in a year-round ice-free arctic any time soon. I don't see recent data as changing anything. Ice thickness in April should be at least 1 m.
So, 21 km^3 ice would almost have to be the floor. To get below this volume we have to see large areas of open water through winter or ice that can't even manage to get 1 m thick during winter. We start the melt season with the same amount of ice (volume-wise). I see no likely physical process that can cause gains in September minimum other than natural variations due to weather. We know temperatures are going to increase - so the status quo will not be maintained. Is it *possible* that we see a long, drawn out, protracted road to an ice-free summer? I suppose so - but I wouldn't bet on it. No, I wouldn't bet on it either. But it's proving interesting to look at the question of whether the spring/summer loss would be enough to overcome the growth of ice over autumn/winter. I've tried putting together a set of equations derived from scatter plots. The result wildly crashes upwards within 15 years. Spring/summer is proving a lot less tractable than the strong ice growth in autumn/winter. Which reminds me that I've had the makings of a post on autumn ice growth for some time. Might be the one to blog on next as I've recently been looking at the early June area drops. You shouldn't be so hasty to claim there is a stabilization of the system - based on the time series, the deviation from a continuing downward trend with no abatement is no larger than the size of the other fluctuations in the series. Although I don't think you would fall into this trap necessarily, you should avoid seeming too much like the "global warming stopped in 1998" crowd. 3 years isn't enough for anything but asking the question. It's a reasonable question to ask: Whether growth season response to low sea ice could have the power to cause a long tail (or longish tail really), and if it's the reason for the last three years having near identical peak volumes. Asking these questions and then puzzling over them is the most interesting thing about this hobby. Very, very interesting stuff, Chris. Thanks a lot for turning on the light. With regards to volume increase since the 2012 minimum: it's only since the start of February that the 2013 trend line started to creep up. Before that it was consistently at the same distance from the trend lines from the two previous years. Also notice how the 2011 trend line after the minimum quickly started hugging the 2010 trend line (turning into 2011 and 2012 after New Year, of course). It could very well be that the conditions that caused the cracking event - big, intense highs causing leads (-> more ice) and low temperatures over a large part of the Arctic (->more thickening) - has caused the late uptick. Or cause PIOMAS to think there's an uptick (although I think it probably is/was real). This could perhaps be a simpler explanation, although the negative feedback is starting to come into play. I thought it would do so later, but it makes sense that it is already becoming noticeable. So that's the second negative feedback, after increased winter snowfall. PS I heard today that another CPOM scientist, Katharine Giles, died in an accident today. A horrible blow for the institute, after the recent loss of Seymour Laxon. As I say the idea I pursue in the second half of this post is speculative, if nothing else three years isn't enough to say anything definite, and I can't recall PIOMAS uncertainty off the top of my head, but I'm fairly sure that this could mean the three recent years aren't really so close. 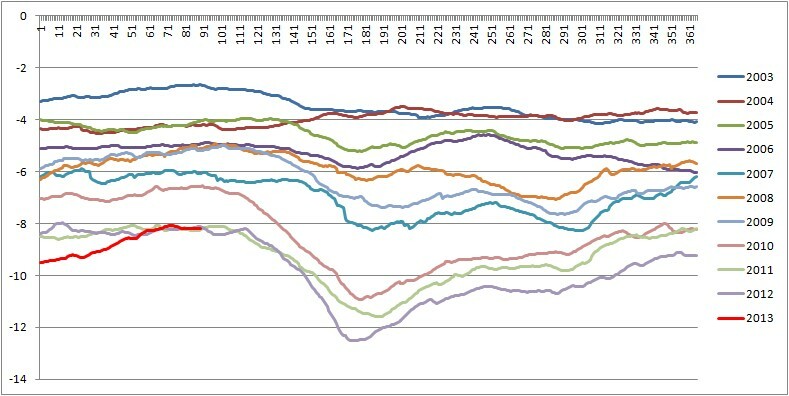 It's worth noting that Cryosat 2 found a volume decline between 2011 and 2012, when PIOMAS didn't. However I do suspect that the autumn/winter thickness/growth feedback will cause a tail, and there won't be a sudden crash out to sea ice free. Bad news about Katharine Giles.